I realize the importance of good tools in the kitchen. As a novice cook, seriously, what are the best Chefs knives and exactly what ones do I need. I dont want to go broke, but I want a professional set. Every cook needs a good knife. Its the one thing you cant do without in the kitchen. Choosing a proper knife depends on several factorshow many hours you will be utilizing the knife and the actual way you will use the knife. Personally, if you can only have one good knife, a chefs knife is what you want. This is the knife I use 95% of the time. A chefs knife has a blade between 8- and 10-inches long and is the most suitable for the greatest variety of tasks. I use mine not only to chop, but to filet fish, butcher a chicken, even smash garlic. I favor Mac Knives and a Chefs knife will run about $130, but I have had mine 8 years and it is still in perfect condition. Also, I have never sharpened mine on a stone, as I recommend a diamond sharpening steel. 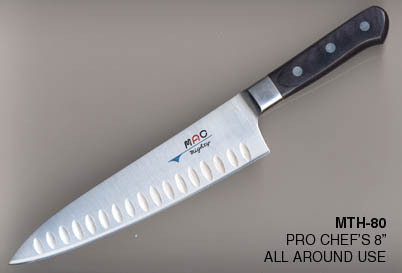 This company produces some of the sharpest knives around and is recommended by renowned chefs. The blades are made of superior steel of high carbon chrome molybdenum with vanadium. The knives are narrow in the French style, but are light and flexible like Japanese knives, allowing you to cut through most foods using minimal efforts. Less Fatigue….Choose a knife that is light in weight, perfectly balanced, and ergonomically designed to reduce fatigue during your cutting chores without making your hand and arm tired. . Make sure the knife has a secure grip and a good feel in your hand, youre looking for balance. The handle should be riveted to the blade. A high quality chefs knife will cost you around a hundred dollars, but if properly taken care of it will last a lifetime. Thanks so much for the great tip for the Mac knives! I have used Henkels in the past, and the Macs are SO MUCH LIGHTER and sharper and really hold an edge! Based on your recommendations, I purchased the Chefs knife, a paring knife (ok, I have to have it! ), and a boning knife. These knives have vastly improved my knife skills alone! This entry was posted on Thursday, June 14th, 2012 at 19:08 and is filed under Tools. You can follow any responses to this entry through the RSS 2.0 feed. You can leave a response, or trackback from your own site.